Last Sunday saw the casting off of Fódhla. With no interruptions of other projects for the week meant it was finished and off the needles. All it needs now is to be blocked. I’ve a new set of blocking wires on the way for that which hopefully will be here early this week. Finishes always mean new starts. It obviously didn’t like what I started with it as it ended up being frogged back to a certain point 5 times, yes 5 after which I put it aside until such time as it wants to be knitted up, that may be later this week. and started a new project, it’s moving along well for only having started it at the end of the week. Oh now you weren’t expecting me to show you a full colour shot now were you? Haha, that will be for the end. I will I fear be playing yarn chicken so I want to get this finished or as near to early in the week so I can get my hands on another ball of yarn. This year my aim is to get a spinning wheel, so while I’m gathering the funds for that I need to keep practicing my drafting and using my drop spindle. I hope to spin some of this during this week also. And there you have the yarny week that was and what will be. Should you want to read other blogs taking part in this yop year or indeed to take part yourself check out the Ravelry group here. My project page for all yop projects can be found here. 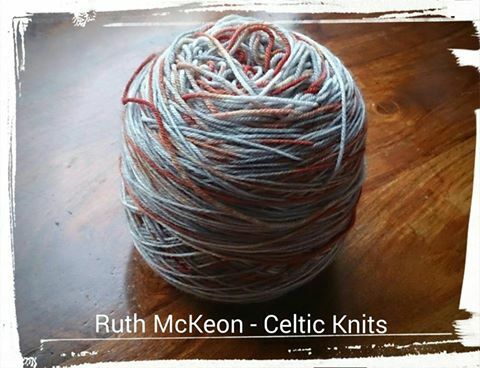 This entry was posted in Celtic Knits, Designs, Knitting, Spinning, Year of projects and tagged Fodhla, New project, new yarn, Shawl. Bookmark the permalink. OH thank you, I’m trying to find the right balance in showing something but yet not showing everything until I have a finished piece, what I love is all these I’ve taken with my phone! Oh thank you, what a really lovely thing to say and yours is one I enjoy reading so much as well, especially your latest one. Looking forward to seeing the second project! I wonder what the yarn wants to be, if anyone can coax it along, it will be you! The new yarn is so lovely, I really like blue and brown combination. And the wool for spinning is also really nice. One if the things I’d love to try is spinning. Still gathering my spirits to dive into it. Some yarn just doesn’t want to cooperate! I hope you settle on something with it as it is a lovely color combination. 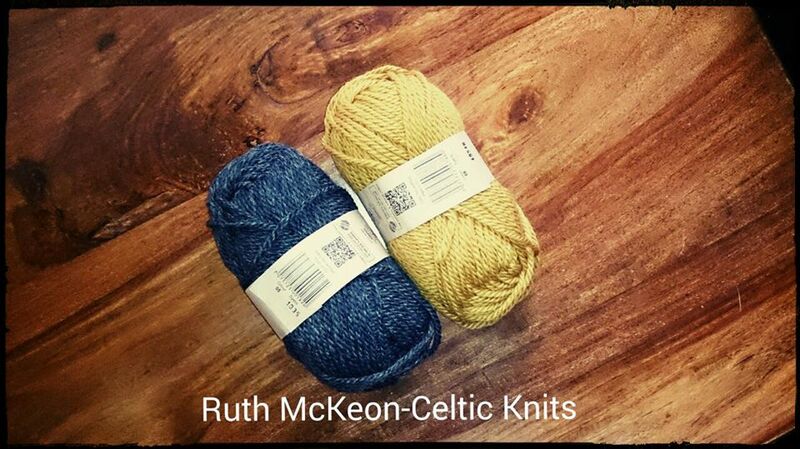 I am also very curious to see what the blue and golden colored yarns will be–that is a combination I really love. I have several wips going and hope to finish at least two of them this week, because there are so many new things I want to try. Just not enough times-and with that, I am off to put finishing touches on dinner! I love finishes as finishes always equal new starts! I like that dark denim wash your yarn has. You will inspire me to get off of my duff and get a pattern out one day. Trying to finish up a few things first. ….ahhh a frogged ball if yarn is a sad sight…it is begging to become something I’m sure! It shall become something, it is just a matter of time I’m sure. I love the spinning fibre! I’ve been eying my latest batt thinking that it needs to be spun up really soon. Have a great week. 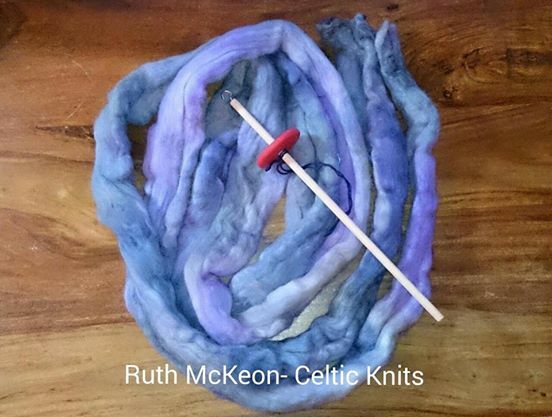 I love this fiber, it was one I had specially dyed for me and the lady who did the dying knew exactly what I was after straight away so made it easy, maybe a tad too easy. I love the colour of the wool your are spinning – gorgeous!